Times of the Islands – Go Fly a Kite! 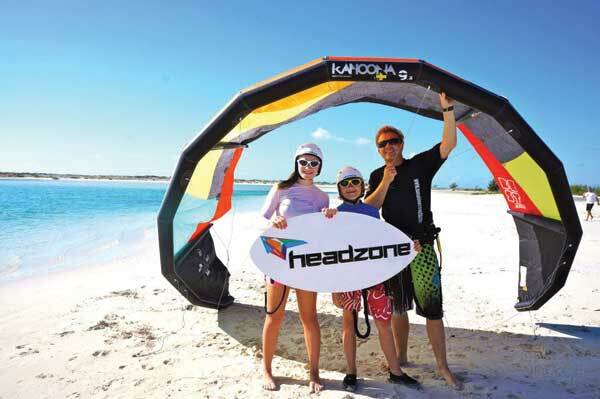 Kiteboarding tourism comes to the Turks & Caicos. 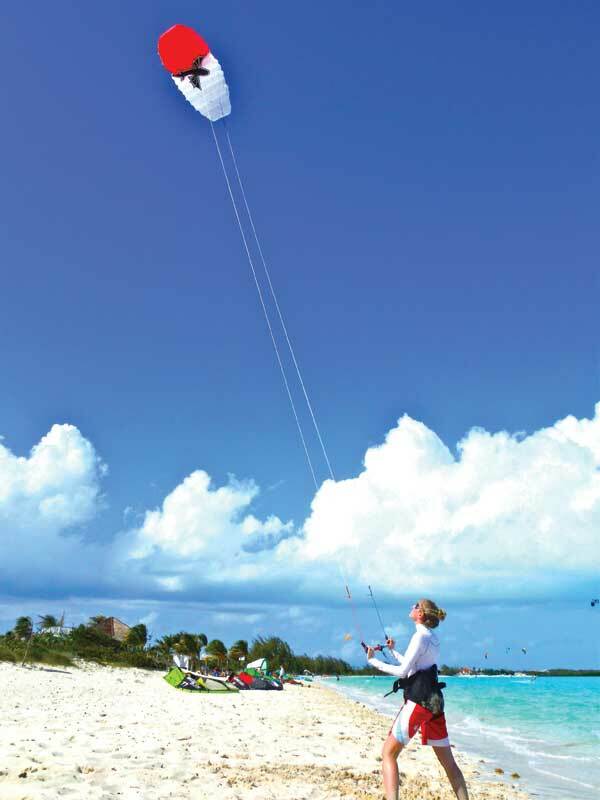 The Turks & Caicos are the ideal place to kiteboard. The secret’s out . . . the Turks & Caicos Islands are a kiteboarding paradise and the perfect place for a kiteboarding vacation! Recent years have seen a sharp increase in “kiteboard tourism” to the Islands — from experienced riders visiting TCI looking for a majestic backdrop to practice new tricks and explore the breathtaking turquoise shores to absolute beginners who come to learn the sport in near-perfect conditions. There’s something for everyone to enjoy. Kiteboarding involves flying a four line power kite of variable size that is attached to your body by a harness at your waist. You use the power of the kite in the wind to pull you across the water while riding on a surf/wakeboard. Kiteboards are bidirectional (can be ridden in both directions) twin tip boards. They resemble wake boards. Some more advanced riders can ride surfboards in the waves, but beginners start in flat water with a twin tip bidirectional board. Although kiteboarding is an extreme sport, with today’s technology in kite design and safety systems, kiteboarding can be one of the safest sports with proper professional instruction and training. What makes the Turks & Caicos Islands such a kiteboarding paradise? Start with warm, shallow water, add long stretches of uncrowded beaches lined with sugar-soft sand, combine with consistent trade winds most of the year and it’s easy to see why the TCI has the perfect “recipe” to be a growing hot spot for kiteboarding tourists — experienced and beginners alike. Most of the kiteboarding and, particularly, kiteboarding lessons take place on the south shore of Providenciales at Long Bay. The beach access at the site of the proposed Shore Club development has become quite a bustling kite spot these days. (But by many standards around the world, it’s still an untouched and uncrowded oasis for vacationers coming to kite.) The water is warm and shallow for miles and the bay is wide open, so it is the perfect place to learn. That said, there are also many spots to explore around and beyond Providenciales in North, Middle and South Caicos. Any deserted beach, given the ample wind conditions, is essentially a kiteboarder’s dream. Depending on what you’re looking for — be it flat water conditions or small playful waves — you can find it somewhere on this island oasis! Some of the world’s leading kite companies are coming to the Turks & Caicos for product testing and photo shoots. There is no doubt that the influx of kite tourism and its increasing popularity is fantastic for the country and our economy. In fact, the TCI is rapidly gaining a reputation as one of the best kiteboarding destinations on the planet! Most recently, Turks & Caicos played host to some of the world’s best kiteboarders, including the current two-time world champion Youri Zoon and kiteboarding legend Ruben Lenten. Some of the leading kite companies are choosing to come to the Turks & Caicos Islands for product testing and photo shoots. All of this attention is quickly showing the world exactly what we’ve known for years — that the TCI is the ultimate place to kite! Icing on the cake are plenty of kite-friendly accommodations and opportunities for both locals and tourists to get involved in this exciting and fun sport. Some choose to rent out a private beachfront home on Long Bay, while others prefer to stay in one of Grace Bay’s fantastic luxury resorts. Many beginners have lots of questions about kiteboarding — currently the fastest growing watersport in the world! Is it dangerous? Is it difficult to learn? Do I need lots of upper body strength? How many lessons will it take before I can kiteboard on my own? We encourage you to look at our website FAQs for more detailed information. In short, kiteboarding is an extreme sport that is very safe if students learn the proper first steps with an IKO qualified instructor. It requires very little upper body strength and is a great core workout. It is safe and has little to no environmental impact. It takes about 2–3 lessons with a qualified instructor to be independently riding away, although each student learns at a different pace! We are proud and privileged to be able to kiteboard and teach this exciting sport in such a beautiful country. What are you waiting for? Come on out and give it a try! For more information, visit www.tckiteboarding.com. TCK was founded by Wayne Lynagh who has devoted his career to kiteboarding instruction since 2007, sharing his love for the sport with students all over the world. Before coming to Providenciales, he was an integral team member in opening the Best New York Kite Center and taught in New York from 2007–2010. He has also taught in Ireland with Pure Magic Kitesurfing, Tulum Mexico with Extreme Control Kiteboarding and most recently in Providenciales with KiteProvo. He has vast experience organizing kiteboarding trips and clinics around the world including Dakhla Morocco, Fortaventura, Spain and most recently Lake Nitinaht, BC, Canada. Wayne is a Level 2 certified instructor with the IKO. He is also a certified SUP instructor with the ASI (Academy of SUP instruction). He loves all watersports and is looking forward to sharing his passion with others!